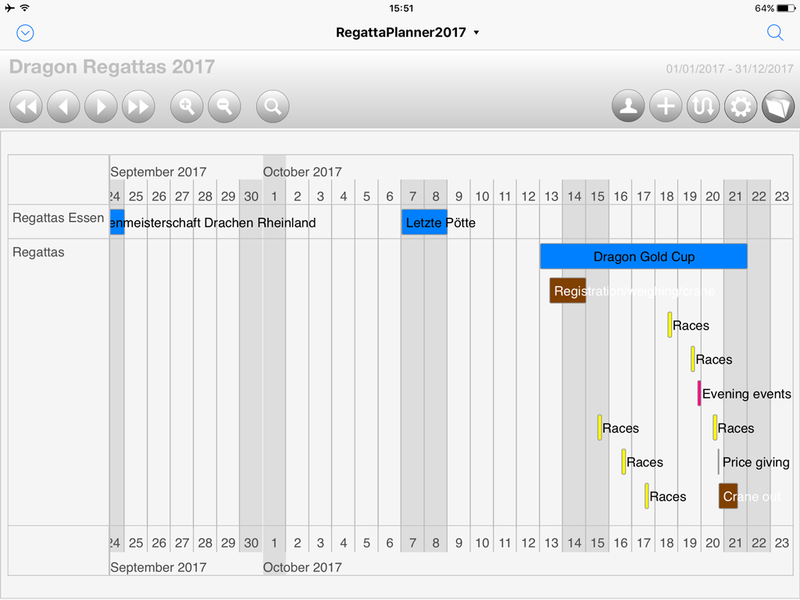 RegattaPlanner helps you to plan and organize your regattas. 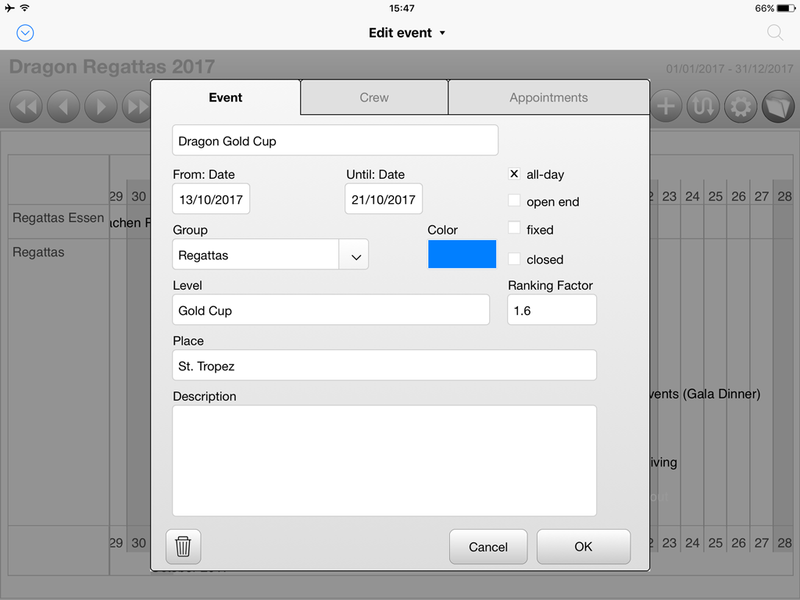 Whether you are sailing a one-hand class or on a yacht with a large crew, RegattaPlanner will show your schedule for your regattas intuitively on an interactive, horizontal timeline. 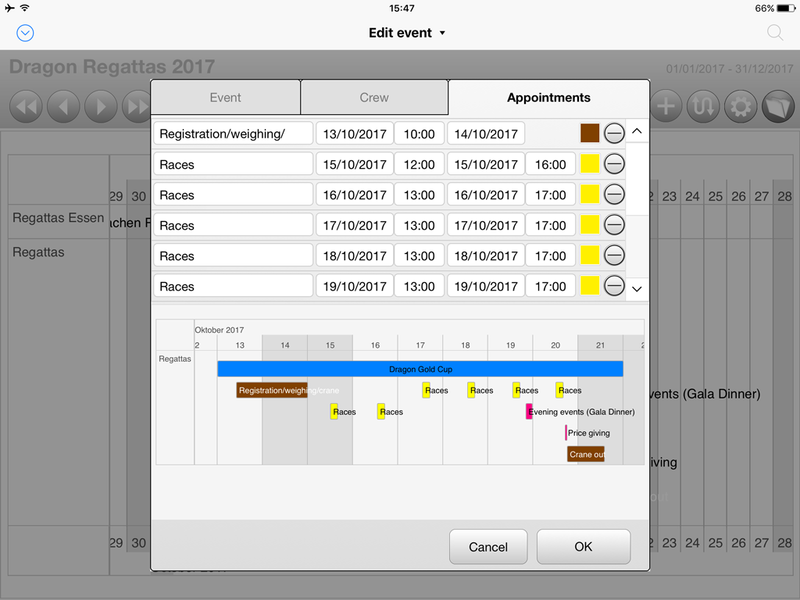 And with the crew list from RegattaPlanner you can simply put together your regatta crew for each event. Create an event for each regatta and then schedule all your appointments during this event from the arrival and registration to the races and to the evening program. The section of the timeline which is displayed on the screen can be moved or zoomed by using buttons or gestures. You can show only a few days, several weeks or months or a whole year. With RegattaPlanner all your events are clearly structured and displayed. In the top level of the structuring you will find the groups with which you can group your regattas, for example by locations, boat classes or ships. 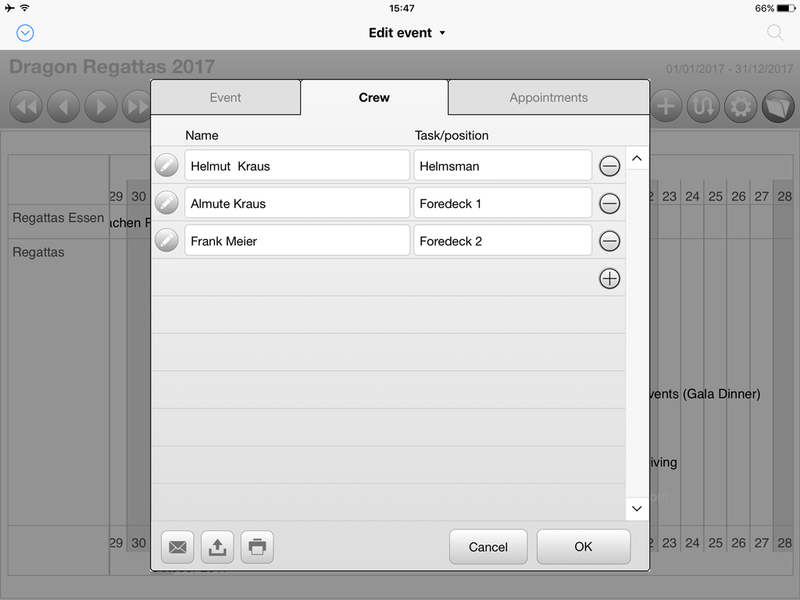 In addition to scheduling, RegattaPlanner offers a crew list in which you can record information on your crew members such as address data and telephone numbers as well as qualifications and possible functions on board. For each regatta the persons in the regatta crew and their functions on board can be selected from the crew list. And with just one click you can create an email for all the crew members which you have selected for the regatta. Of course the regatta calendar and the crew lists can be printed and saved as a PDF. 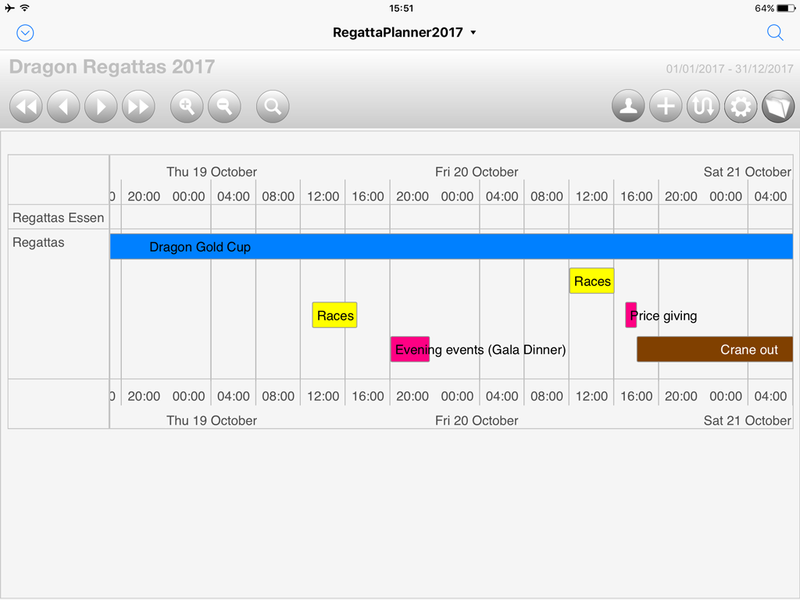 For the regatta calender you can choose a time period and different resolutions. 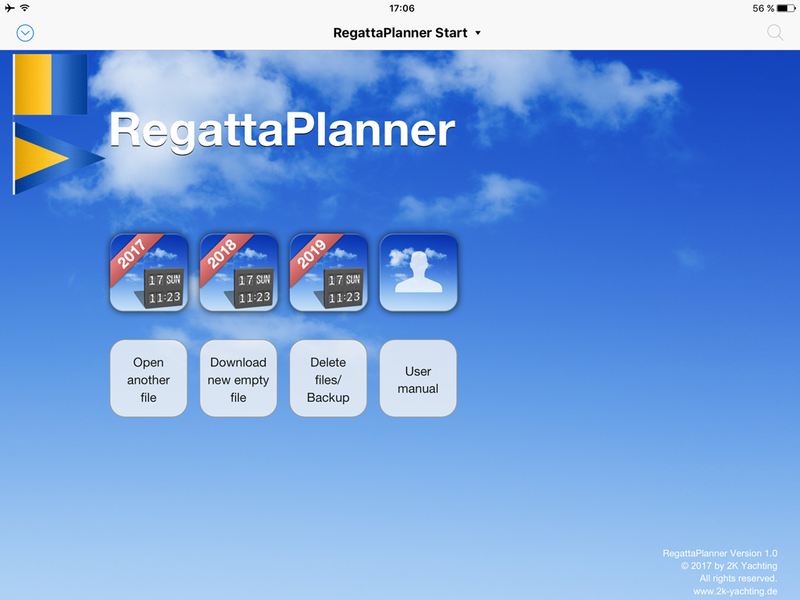 RegattaPlanner is available as iOS app for iPhone and iPad and as software for Mac and Windows. All data created in the software can be transferred from one device to another via Cloud or iTunes and then be edited. 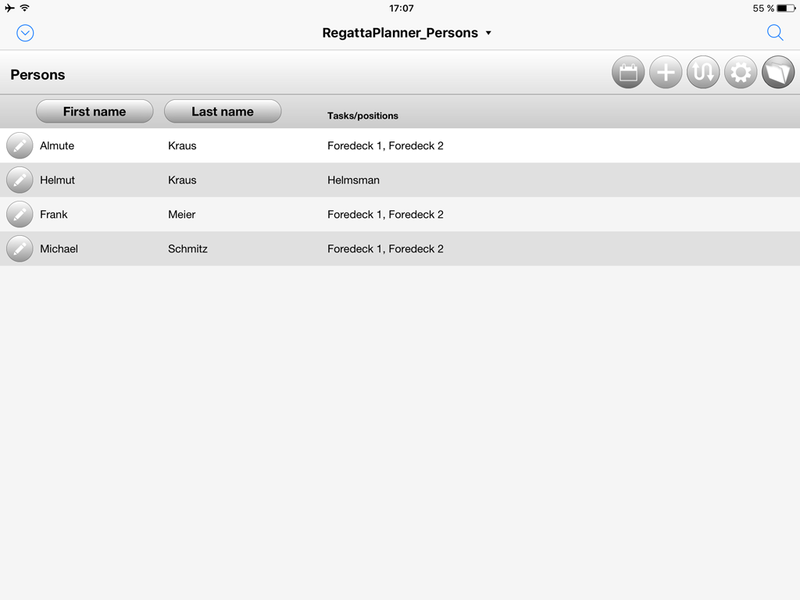 The user interface of RegattaPlanner is available in German, English, Dutch and Swedish. The start window of RegattaPlanner offers handy functions for opening, loading, saving, and deleting RegattaPlanner files. 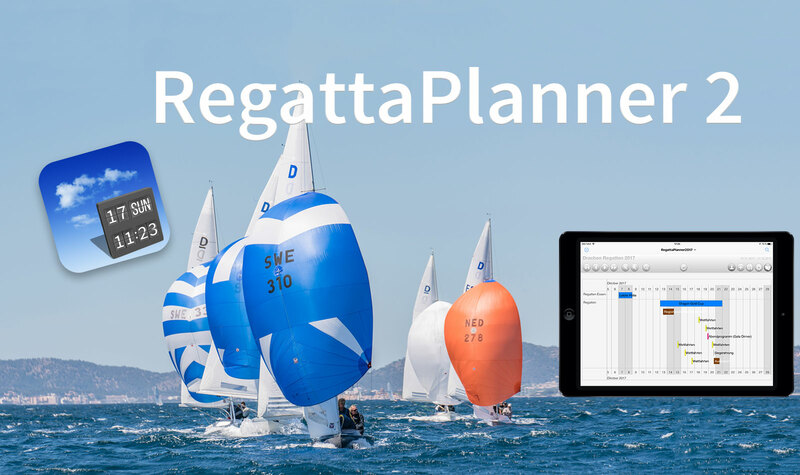 Get your free trial version of RegattaPlanner and explore the features. The trial version provides all features of the full version, but is limited to 9 entries. 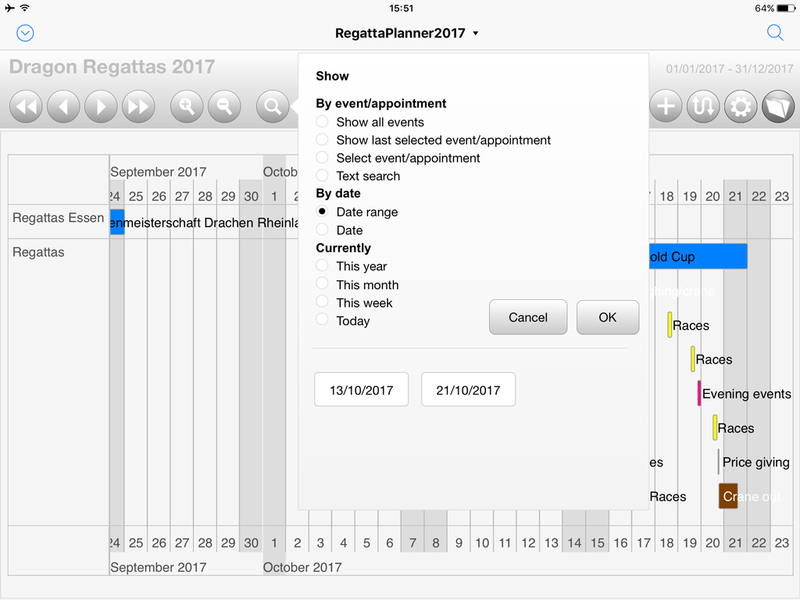 With the buttons on the right you can download RegattaPlanner for Mac and Windows or you get directly to the free download of the iOS version in Apple App Store. You can also download a detailed manual for RegattaPlanner from our download page. If you like RegattaPlanner, you can purchase a license in our shop (€ 25.00*) and convert the test version directly to a full version. Since 01/01/2015 a new EU law requires that products which are distributed by download, are sold including the VAT rate of the customers state of residence. Therefore, different prices than shown here may occur for you. In our online shop all products are show with the final prices valid for you and your state of residence, when you are logged in with your personal data. To all customers outside of the EU we deliver without VAT. The customer is responsible for taxation in his state of residence. The start window of RegattaPlanner offers handy functions for opening, loading, saving, and deleting RegattaPlanner files. Planners for 2017 until 2019 are already prepared. … and the person details. As an alternative to moving and zooming by using buttons or gestures, the time perioad displayed on the screen can also be set via the options in the pop-up Show. When zoomed-in only a few days of an event are visible. 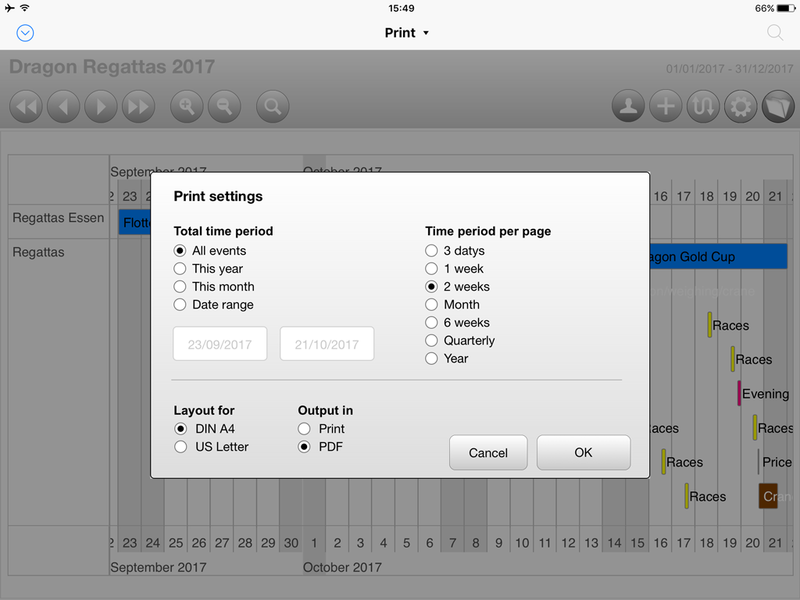 In the print dialog, the desired time period from the timeline and the resolution can be set.